The wall or crust is the horny sheath incasing the end of the foot, in the front and on the sides from the coronet to the ground. It is through this crust the nail is driven, and it is upon this crust the shoe rests. In front it is deepest, towards the quarter and heel it becomes thinner. It is of equal thickness from the upper end to the ground (from top to bottom). The white colored wall is the poorest, while the iron colored wall is the toughest. The growth of the wall is different at different ages. It grows more in a young horse and colt than in an old horse in a healthy foot and soft, than in a diseased foot and hard. 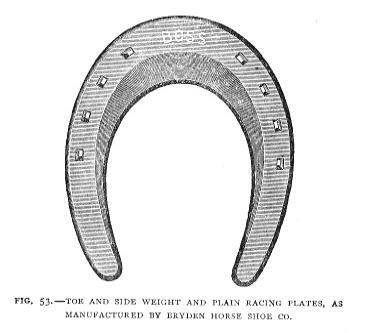 In a young horse the hoof will grow about three inches in a year and even more, while it grows less in an old horse. The wall is fibrous, the fibers going parallel to each other from the coronet to the ground. The horny sole is the bottom of the foot. This sole is fibrous like the wall. The sole is thickest at the border, where it connects with the wall, and thinnest at the center. The sole when in a healthy condition scales off in flakes. This scale is a guide to the farrier whereby he can tell how much to pare off. There are different opinions in regard to the paring of the sole, but that is unnecessary, for nature will tell how much to cut off in a healthy foot. In a diseased foot it is different; then the horse-shoer must use his own good judgment. It is, however, in very few cases that the shoer needs to do more than just clean the sole. Nature does the scaling off, or paring business, better than any farrier. 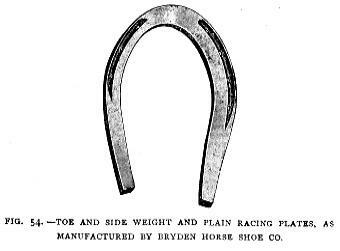 The frog is situated at the heel and back part of the hoof, within the bars; the point extending towards the center of the sole, its base filling up the space left between the inflection of the wall. This body is also fibrous. The frog is very elastic and is evidently designed for contact with the ground, and for the prevention of jars injurious to the limbs. Coronet is the name of the upper margin of the foot, the place where the hair ceases and the horny hoof begins. The quarter means a place at the bottom of the wan, say, about one-third the length from the heel towards the toe. By the bars we mean the horny walls on each side of the frog, commencing at the heel of the wall and extending towards the point of the frog. Any blacksmith or horse-shoer desiring to study more thoroughly the anatomy of the horse should procure a book treating on this subject.